Galaxy Squad revolves around an intrepid band of space explorers that travel the universe defending planets from huge insect like alien bugs. It was a revamp of the Space theme that only lasted one year, but came up with some pretty interesting looking sets. There were four teams, each a different colour – Billy Starbeam led the Red, Solomon Blaze led Blue, Chuck Stonebreaker with Green, and Orange had a duo of Jack Fireblade and Ashlee Starstrider. Each team also had a robotic sidekick. You might remember an older looking Solomon Blaze from the Ultra Agents range – it’s the same guy. He gets around a bit! Galaxy Squad was released in two stages, with some sets coming out in late 2012, early 2013, and another wave in mid 2013. A couple of polybags were released too. 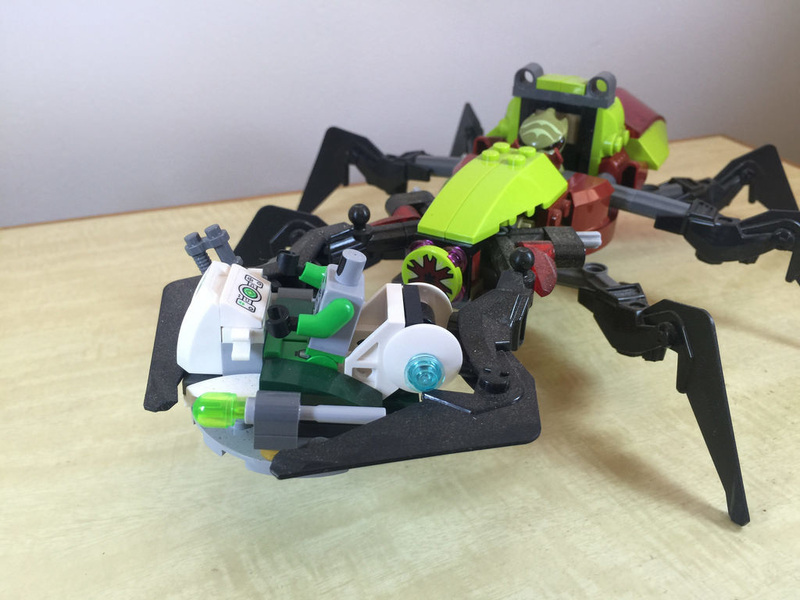 Anyway, the Crater Creeper is a six legged creepy crawly bug. 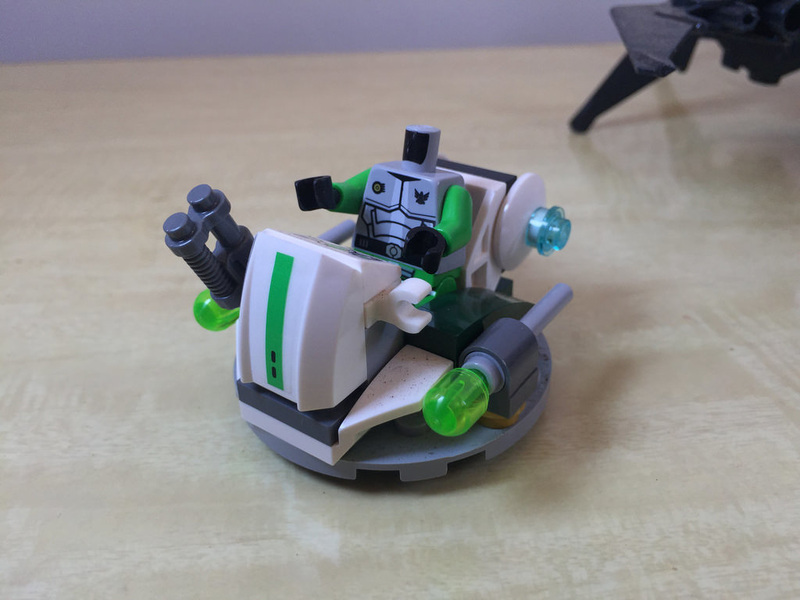 The set comes with another little flying piloted drone thing, and two minifigures. In this case, it’s Chuck Stonebreaker and an Alien Buggoid. For a relatively small set of less than 200 elements, this one has a pretty decent range of unique ones. 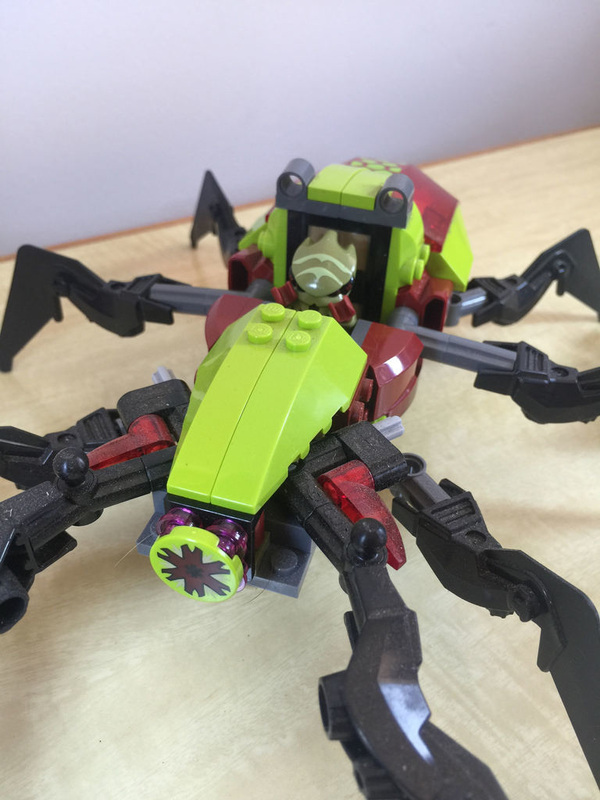 The transparent red shell at the back of the Creeper is unique to the set, and the legs and pincers (same element) have only been seen in two other sets – 70703: Star Slicer from Galaxy Squad, and originally in 6228: Thornraxx from Hero Factory back in 2012. There is a lot of elements in Bright Yellowish Green and New Dark Red, as well as many different varieties of sloped bricks and plates. A pretty good range all up. 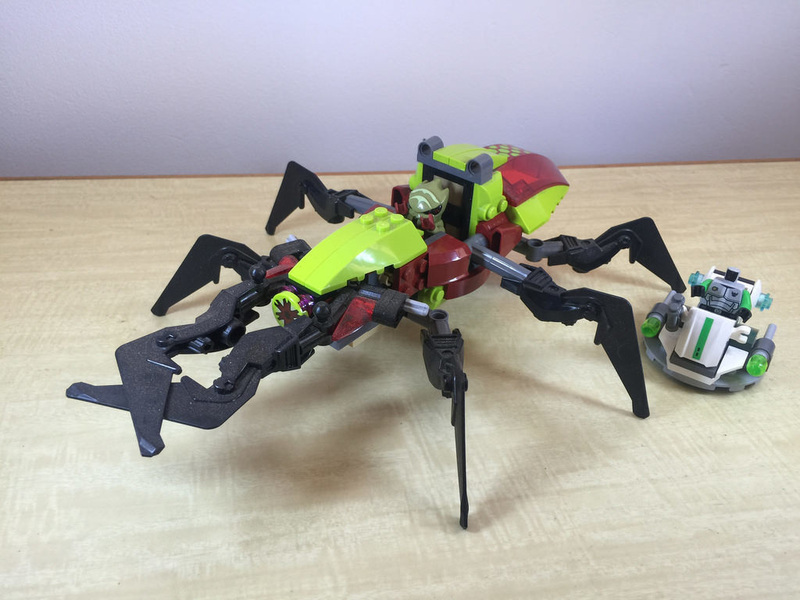 The two minifigures are of course unique to the theme, but are seen in other Galaxy Squad sets. I didn’t manage to find any complete, so no photos for them this time. You’d think just from looking at the set that it’s a pretty great play set, but after building it, I really wasn’t so sure. Yes, it has those six long spiky legs, and the two grabbing pincers, but aside from that and the little flying shuttle thing, that’s really it. There’s no walking mechanism, and the legs aren’t really articulated at all, aside from the two middle ones that droop slightly. In saying this though, it’s all a matter of who is playing with it. Adults might not think it’s that great a swooshy set, but I think kids would love it. I can just imagine them trying to grab everything in the house with the pincers. The little flying shuttle is good fun to dive bomb the Creeper too, plus it’s a target for the little flick fire missiles above the driver. The one I built was missing them, but the image below shows where they belong! The build comes together quite quickly, as there aren’t too many different elements. The little shuttle is built first, followed by the Creeper. 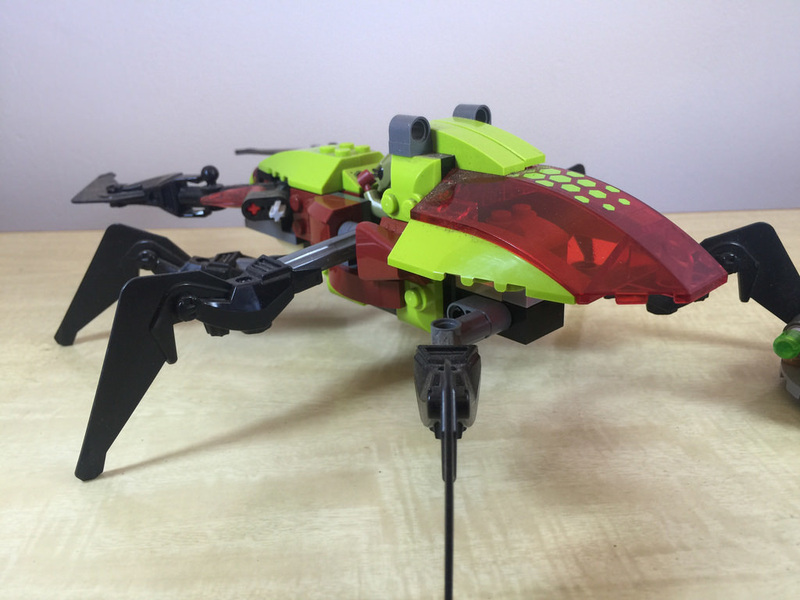 It’s a pretty durable build, which surprised me a little, as it’s not a brand new set, so I was expecting the legs to fall off after a while. Nothing has come loose, even with a little flexibility in the legs. 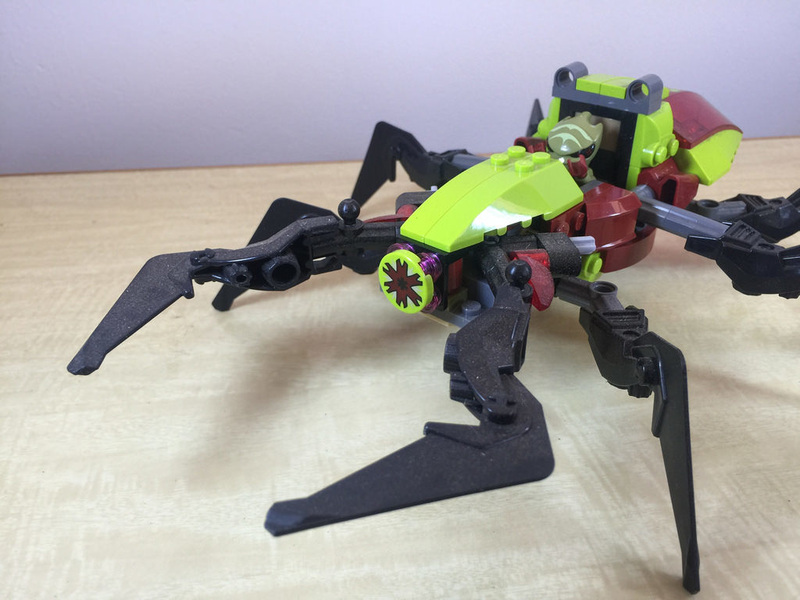 The legs are what lets the build experience down a little though, as most of the leg is a single piece. Sure it looks pretty neat, but there’s no building. There’s a bit of SNOT building for something a little different, but that’s really it. Building animals is pretty fun, especially when it’s a larger format. The look of this creature is pretty fantastic, but I would have liked to have had a bit more of a canopy for the driver. It just seems a little unfinished in that one spot. Since this is a retired set from a retired theme, collectibility is pretty high. It’d be worth having in the collection for the parts too, even if it wasn’t built and on display. Value for money is pretty good in this case too. Purchase price on the secondary markets is at around $23 for a completed set, and that’s new. You end up saving a bit of money on a pretty cool looking set. This one is worth picking up. Next week I’ll be leaving the sets from the bulk lot for a couple of weeks. The sorting room has been packed up for a weekend while family is in town, so I’ve built one of my own sets (finally!). I got stuck into 21303: Wall-E, and it’s a ripper!